Four decades ago, Granville Island was nothing more than a gritty and neglected industrial area. In the 1970s, the federal government invested $20-million to dramatically improve the 38-acre chunk of land—transforming it into a bustling, multi-use public space that’s now home to hundreds of retail shops, artist spaces, a market and more. It’s an extraordinary success story in urban development. And now, it’s once again time to revitalize the island. While much of Vancouver has seen tremendous shifts over the years brought on by population growth, economic changes, immigration and so on, Granville Island has seen very few. Traffic congestion and increased competition from upscale supermarkets and farmers’ markets have put pressure on the island. So has the relocation of its 37-year tenant, Emily Carr University of Art and Design, to a new campus in the False Creek Flats—which freed up the equivalent of a quarter of the island’s available space. 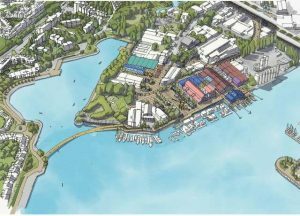 The Canadian Mortgage and Housing Corporation (CMHC)—the crown corporation that’s managed the island since 1973—rolled out a plan for the future of Granville Island over the next 25 years. We’ve sifted through the proposal (check out the full version here)—and put together some of the most transformative changes that could be coming. The proposal highlights four strategies for Granville Island’s renaissance. Getting to Granville Island can be tricky. Since it’s poorly served by transit (just one bus route serves the island), most people drive—which causes a lot of traffic congestion. Right above the Island, however, a city bus passes every two minutes on the Granville Street Bridge. A new elevator has been proposed that would increase the number of visitors to the Island and move away from cars as the primary mode of travel. It would connect a bus stop on the Granville Bridge to the heart of the Island (near the covered parking lots). There are also design concepts for a tower feature that would offer a viewing platform above the bridge. With the elevator, it’s estimated that about 200,000 additional people would be within a 30-minute trip to Granville Island. Next steps include conducting technical engineering and financial studies to assess the viability of the elevator. 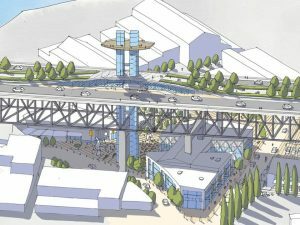 To make it easier for pedestrians and cyclists using the seawall to access Granville Island, a new bridge across Alder Bay has been proposed. The bridge would provide improved access and visibility to the quieter east end of the Island—distributing visitors more broadly. The biggest draw to Granville Island is the Public Market. But research shows that a lot of people think that it lacks high quality foods, doesn’t offer enough local and sustainable products, and has a shortage of public seating. The new plan aims to re-establish the Island into one of North America’s leading food and restaurant destinations. For starters, it would expand the public market floor space by 20%. That could be achieved by adding a second floor, expanding the building into the existing courtyard facing False Creek, and integrating the Revue Stage space into the market. The plan says that expanding the Market will allow for a greater variety of offerings, including more culturally diverse foods, cooking workshops, special events, and night-time activity. Did you know? 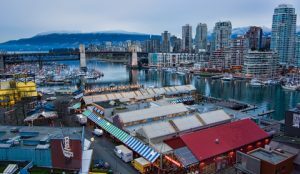 Granville Island’s mix of artisans, shops and restaurants draw an estimated $10-million visitors a year. Of those visitors, 80% are locals. The plan also aims to create a wider market district that would be linked to the new and enhanced public spaces at the centre of the Island. 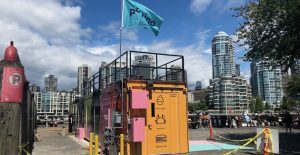 One example of that is Popina Canteen, a new outdoor restaurant created by four Vancouver chefs. Built in old shipping containers, it begins the transformation of the area around the Public Market into a larger Market District. With the relocation of Emily Carr, a new Arts and Innovation Hub would be established in the vacant north building. The Hub will be a new destination on Granville Island with a mix of arts-focused and innovation organizations as well as restaurants and services in a 120,000-square-foot space. So far, there’s been a “call for ideas” among creative professionals on how this building should be used. The opening of the hub is slated for 2021. 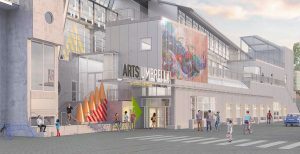 Meanwhile, Arts Umbrella—a non-profit that provides arts education for children and youth—will be moving into the former Emily Carr University South Building in 2019. When it does, it will offer seven dance studios, five theatre and music studios, eight visual and media arts studios, a 160-seat professional theatre, a publicly accessible exhibition gallery, and new workshop spaces. 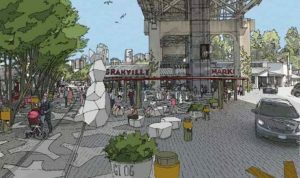 Granville Island could see a new central plaza at the heart of the Island, named “The Chain & Forge” after the Canadian Chain & Forge Factory that operated on this site during its industrial era. Located under the bridge, from July to September the plaza would become a gathering place to enhance social connections through diverse outdoor programming, temporary structures, installations, pop-ups and workshops. There’s also hopes to enhance the waterfront as a public space by adding floating platforms, creating a Fisherman’s Wharf for fresh and prepared seafood, and a man-made urban beach in Alder Bay. The next steps are to find out if the construction projects are structurally and financially possible—so there’s no word yet on if or when they’ll become a reality. 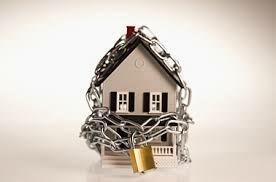 But even now, we are seeing changes from the CMHC. For instance, pay parking will be implemented across the entire island as of June 1, 2019. The CMHC believes pay parking is needed to help reduce traffic congestion, as drivers often circle the island looking for a free parking spot.